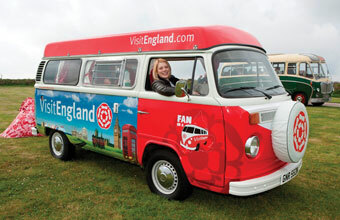 VISITENGLANDï¿½S Fan in a Van, Rachel Kershaw, has set off her 70 day journey around England. Rachel was named England's biggest fan following a nationwide search by the national tourist board and was waved off in style from Cornwall. Travelling in a vintage campervan named Rosie, Rachel will visit every corner of England on her trip, experiencing the best the country has to offer and blogging and tweeting about her adventures and discoveries as she goes.